Eugene the Mummy Man’s gravemaker is shown recently in the Sabina Cemetery. Recently, I heard a story about a small town’s peculiar claim to fame and it really interested me. I wanted to share it with those who have never had the chance to read it before. Sabina, Ohio is home to one of the strangest, most morbid tales of rural Appalachia. It’s a story of mystery and an extremely unusual local hero. The story of this “Mummy Man” is both bizarre and complex, from his death to the 35 years that followed. Let’s start from the beginning. An African American man in his mid to late 40’s was found dead from natural causes on a road near Sabina. He was alone and without identification, believed to be a wanderer in search of a job. Townspeople claimed to have seen him walking in town the day before, appearing to be ill. The only things in his pocket were $1.40 and a slip of paper with the address 1118 Yale Ave., Cincinnati. Upon invesitgation, authorities arrived at the address only to find a vacant lot. The identity of the man was still a complete mystery so they decided that the name of a nearby neighbor, Eugene, would work for the time being, at least until they figured out who he was. Why name him Eugene after the neighbor? We can’t be sure. However, the real Eugene was probably a little disturbed that they named a corpse after him. Eugene the Mummy Man was brought to Sabina’s Littleton Funeral Home and embalmed. They set the mummified man in a brick shed near a bus stop so that people could come by and identify the body. The typical 30-day period of viewing passed with no luck, but the Littleton family held onto the hope that someone would recognize Eugene. Pretty soon though, Eugene became a permanent resident of Sabina. Somehow, having an embalmed dead guy permanently housed in a shed by the funeral home didn’t strike people as that strange. In fact, they loved their odd town mascot. Eugene had a couch to rest on, was dusted and cleaned, and his clothes were changed when they got dingy. The local kids inevitably pulled pranks and tricks on poor Eugene throughout the years, from putting him in different places to stealing his gold teeth. He became something of a local legend, and Sabina citizens and people from neighboring towns spread the news of their special story. Over a period of 35 years, it is estimated that Sabina’s mummy man was viewed by 1.5 million people. Eugene had his share of meddling kids, but the tradition of using Eugene in high school pranks finally went too far when in 1964 Eugene took a trip to The Ohio State University. He was set on a bench outside the campus in the middle of the night to surprise the students (I would definitely not like to be the one to find that in the morning). The Littleton Funeral Home was notified and Eugene was sent back to Sabina, because obviously that’s where you call when a mysterious mummy shows up at your college. After this stunt, it was decided that maybe dead people should actually be buried. 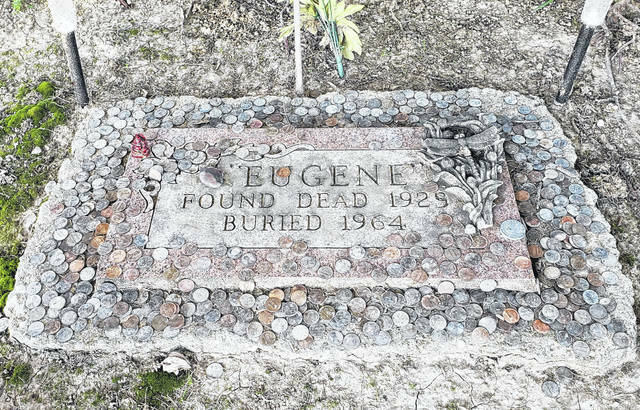 A plot in the local cemetery was bought and a stone with “Eugene, Found Dead 1929, Buried 1964” was prepared. Eugene finally settled down in a nice grave — although the inscription is incorrect. He was actually found in 1928, not in 1929. “It was a simple but dignified committal service and was the concluding chapter of 35 years of mystery,” the Sabina News Record reported about the occasion. Thus ended the era of Eugene, the Mummy Man of Sabina. Although Eugene was never recognized and his real name is still unknown, he became a local celebrity and roadside attraction for many years. I decided to visit Eugene’s final resting place (for real this time) in the Sabina Cemetery. I took the pilgrimage out to Sabina on a Sunday while the sun was setting. After some searching and researching, I found Eugene’s plot under a large shade tree next to the road. His tombstone is flat to the ground and completely ordinary looking, except for the hundreds of coins scattered around the inscription. A tiny red Buddha figurine, a large silver coin with Bible verses and a dove, and several smooth stones are among the trinkets and gifts also on the gravestone. The coins are a symbol of people who have visited over the years, tokens of remembrance of Eugene. The other trinkets from various religions are gifts of respect for the dearly departed. It is amazing to see how many people knew of Eugene, his incredible story and cared enough to visit. Some of the pennies on top of the layers of coins are dated 2018, so I know he’s had visitors even recently. After a long look at Eugene’s grave, I took a short trip to the place he spent 35 years in — an old brick shed at the Littleton Funeral Home. Just down the road, the small shed is now quiet, and there’s nothing there that suggests it once housed a famous body. The door was locked, but I peeked in the back window. Disappointingly, there’s nothing but boxes and normal shed stuff in there. I took several pictures and then headed home. That concluded my investigation of Sabina’s Mummy Man Eugene, the strange corpse that fascinated people for many years. I have no doubt that as long as people remember him, Eugene will be visited by many, from curious travelers to nostalgic locals. As bizarre as his tale is, he amused and intrigued generations of people, and he will not soon be forgotten. 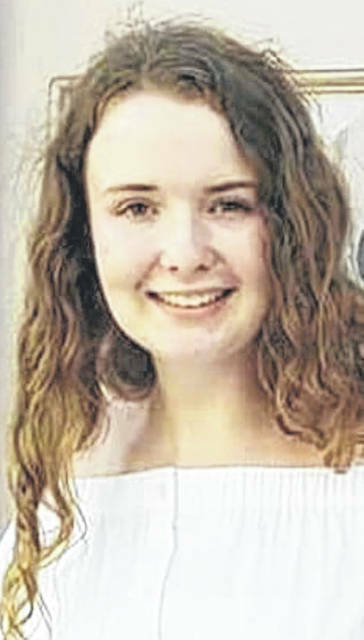 Isabella Warner is a freshman at Fairfield Local High School in Leesburg.